Just a quick update, yesterday was the start of hunting with a gun for “trophy game” in Idaho and Montana. 6 wolves were killed in the first day of hunting in Idaho alone. Montana hasn’t updated its numbers yet, but I wouldn’t be surprised if a total of at least 10 confirmed wolf killings are reported before the day is over. When is this going to end? 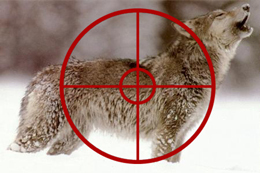 This entry was posted in News and tagged conservation, hunting, hunting wolves, idaho, montana, wildlife, wolf, wolves. Bookmark the permalink. Hard news that can’t be kept a secret.